Vinyl siding is made from a PVC (polyvinyl chloride) plastic resin that is heated until molten and then extruded into sheets. The sheets are then embossed with a brushed or wood-grain pattern that provides textural interest and dulls PVC's inherently shiny and synthetic-looking surface. While still hot, the sheets are formed into siding panel profiles. Manufacturers use additives to improve impact resistance, and to prevent ultraviolet damage and color fading. Color pigments are mixed with the vinyl resin before the plastic is extruded, so vinyl color is full depth, or nearly so. Fascia and soffits add a finished look to your roof and promote a healthy roof system. A well-ventilated fascia/soffit system prevents moisture from building up under the roof and in the attic. A secure system keeps pests, like birds and bats, from nesting in the eaves. That's why it is better to use vinyl soffit for your overhangs instead of wood or fiber cement. Vinyl soffit also comes ventilated, so you could go over existing vents - if doing new construction, you could install vents wherever needed. For fascia, it is better to use aluminum PVC trim coil. The company installing your vinyl soffit and fascia must have a metal brake. A metal brake is used to custom bend aluminum to match all trim and fascia your home has. Aluminum trim for fascia comes in all colors to match your home's design and the color of your walls or brick. After your home has vinyl soffit and fascia installed you will never paint again. Most people think that because they have a brick house they don't need vinyl siding, however, every house has wooden overhangs that must be painted every three to five years. Many homes have no back porch or patio. Porches and patios are a great area for relaxing or entertaining guests. Especially when they are covered to provide shade and protection from rain. A great option for an exposed patio is the installation of an aluminum patio cover. These come in a variety of styles to suit your needs. From budget riser pan styles to structural insulated styles. They can accommodate ceiling fans and lighting and can also be screened in to provide protection from insects and animals. These same systems can also be used to create carports to protect your car and keep you dry as you enter and exit you vehicle. These systems are maintenance free and only require periodic washing to keep them looking new. Aluminum screen wall systems are a great way to keep out insects and animals. They can be installed to existing porches you may already have or to aluminum patio covers, to provide great screen rooms. These systems are very attractive and eliminate the upkeep of old style wood frame screen walls, which must be painted every few years and degrade with age. The purpose of guttering systems is to collect rain water from the roofing area and disperse the water away from your home. Rain gutters come in many different gutter materials, including steel, aluminum, vinyl and copper. Many types of gutters (steel and vinyl in particular) are sold in 10-foot lengths and require dozens of seams fastened with slip fittings, each one is a weak spot and a potential leak site. Another alternative well worth considering is the installation of seamless aluminum gutters, which must be fabricated on-site by a professional contractor. Continuous Rain Guttering (also known as seamless guttering) is nationally recognized as the most popular form of guttering. Seventy-five percent of all guttering installed throughout the nation is continuous. Its popularity is easily understood because, seamless gutters eliminates unsightly seams, reduces the possibility of leaks, protects the beauty of your home and landscaping and there are many colors to choose from. Many styles and colors available!!! 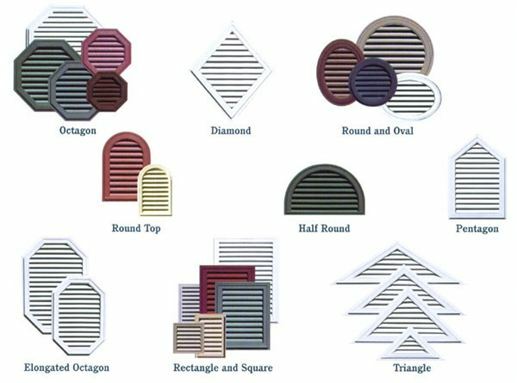 Shutters come in many types and styles. Interior shutters are usually intended to keep light out and enjoy privacy. Traditionally, exterior shutters were used to cover open windows and doors with delicate horizontal slats, letting in light and breeze. Today, exterior shutters are a great way to spruce up the exterior of your home. Decorative vinyl shutters are a great alternative to wood shutters because they are easy to install, won't rot or warp, and are maintenance free. There are many types of shutters, louvered, raised panel and board-n-batten. 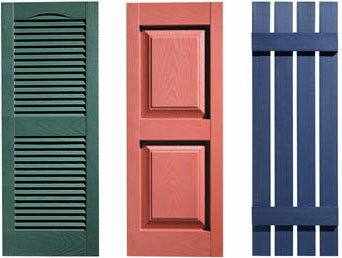 Shutters also come in all the popular colors. Gable vents come in many different shapes and types. The function of any gable vent is to release the hot, humid air that is trapped in attic spaces. The oldest type of gable vent is the wooden gable vent. The wooden gable vent looks good at first, but after some years will need scraping and painting and eventually will have to be replaced. Metal gable vents are more durable than wooden gable vents, but will also need scraping and painting. The best choice for a gable vent is vinyl gable vents. The vinyl gable vent is an excellent addition to homes finished in vinyl, but also compliments homes finished in other materials, such as aluminum, wood shingles, and brick. The vinyl gable vent resists cracking, decay, staining, and it never needs painting. If your home does not have any gable vent ant you are thinking of having vinyl siding installed on your home, it is a good idea to add larger or additional gable vents if necessary. 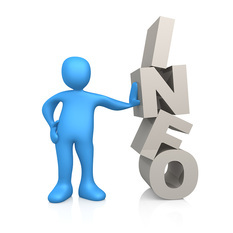 Be cautious of contractors who subcontract. Look for an experienced, on-the-job installer who is eager to show you past work - the best promise of quality is a history of quality. 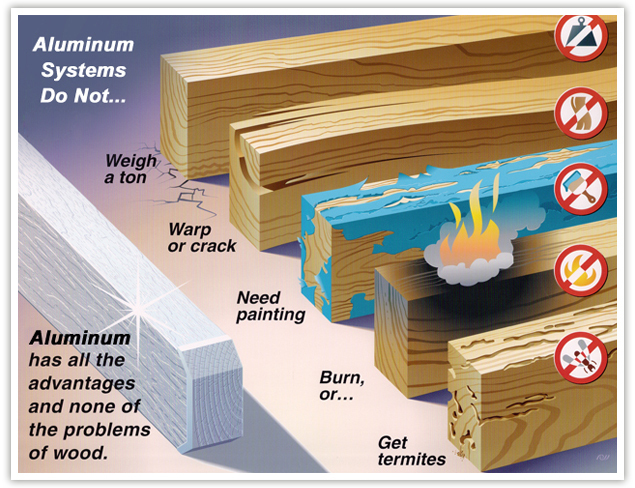 Keep in mind that properly installed vinyl siding has a generally loose appearance. Signs of poor work are bulges, warps and separations in the siding, sags in vinyl soffit and ripples in aluminum fascia.